Mix together your dry ingredients (flour, baking soda and salt). Beat the butter and sugar in an electric mixer until smooth. Add the egg and vanilla and beat for a minute more. If you’re adding food coloring put a few drops in now, it’ll be easier to see how much you need to add later and speed the process up. With your mixer on a low speed gradually add half your flour. Take a moment to add more food coloring here if you’re using it and think you need it. Mix everything on low for a minute here, we need these cookies to be strong over tender so developing a little gluten won’t hurt. Add the rest of the flour and mix until everything all comes together. Divide the dough into two balls. 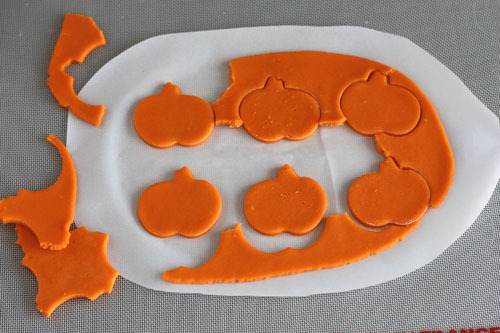 Flatten each a little and wrap individually in plastic wrap. Chill in the fridge until firm, four hours or overnight. 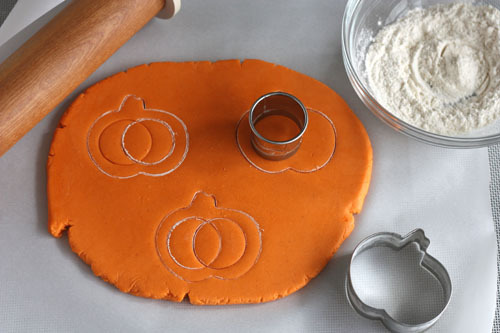 Each amount of dough will make six to eight Trick-or-Treat Cookies. Note: I tried a number of cut out cookie recipes that spread too much for me and settled on a recipe from Real Simple that @seventenclark on Twitter pointed me towards and for which I ended up making a few changes. 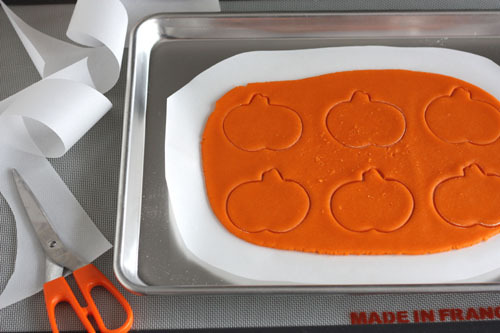 If you have a cut out cookie recipe you like go ahead and use it. I didn’t get to test the following recipes but they were also recommended on Twitter: Inchmark, Joy of Cooking, Dorie Greenspan, Annie’s Eats, and Jamie’s grandmother’s recipe. Thanks everybody! Wow! Perfect for our Halloween Carnival. Thank you! I love the trick or treat idea! Candy eyes would be fun inside too. This is so clever! Great idea! GENIUS. I am going to try this for valentine’s day. These are completely awesome. AWESOME. Thanks everyone! I had SO much fun making these. Alison – Candy eyes would be fantastic!! The only ones I have on hand are too big to fit but those little ones that come on paper would be the perfect size. So smart. The coffins are my favorite too! Love the little zombie hand reaching out, and the ants pouring out look sooo wonderfully creepy. Laura – Yes, those! I can find them here at a cake decorating place that is a bit of a drive so I hope I can make it up there this week. Amanda – I am so relieved you could tell those were hands! I couldn’t get them to come out quite right. Megan, these are awesome! Thanks. I love these so much!!! Thanks for the great tute, Megan! These are awesome! I love all the possibilities! Uncle Beefy – Aw thank you, I’m basking! SUCH a great idea! I might have to make these. :) Where’d you find the sugar ants? Is there a link to somewhere online I could order those from? Thanks! Dinah – The sugar ants are Wilton sprinkles labeled at Jumbo Bugs and come in a container of mixed black and acid green. Did I separate out the black ones for the sake of the photo? Yes, yes I did. I found these at Michael’s craft store and I have tracked them down to here at Amazon as well as here on the Wilton site. As of two days ago at Michael’s they were already on sale so you might get lucky! Thanks everybody for the response, I’m so very happy you like them! Every second of the five (five!) too-spready cookie recipes I tried first was worth it. Too funny! 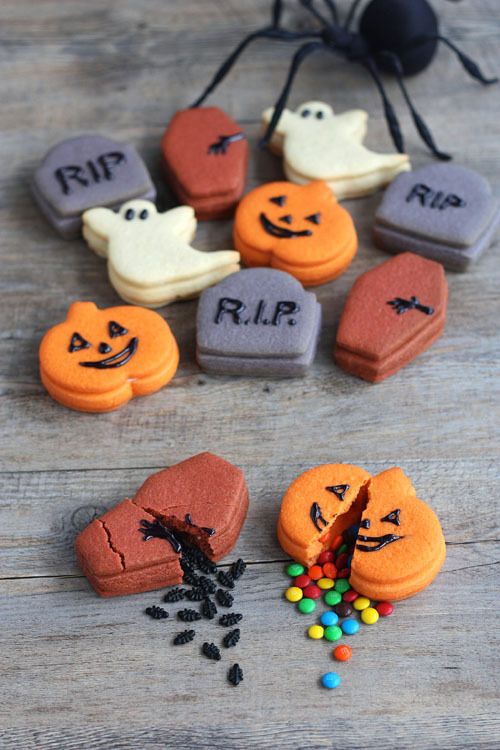 I have had the plans to do this for our Halloween craft sale ever since I saw the pinata cookies. 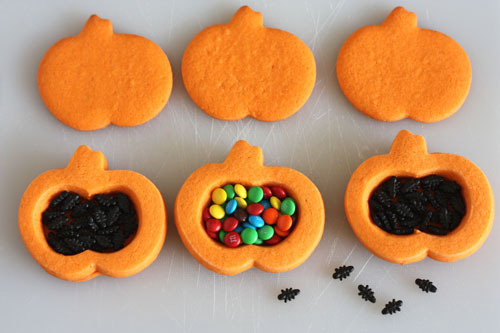 So cute and yummy looking – you are my holiday treat guru! These are amazing. I’ll try the hand coming out of the coffin too although it does look fiddly. Maybe if I did them in white it would look like a skeleton! Amazing idea! May I ask you, what do you use for the detail black stuff on the cookies? Is it shinny dry? Thanks! These are great. I am going to adapt them for Christmas & hang on the tree as a surprise for my grand kids. These is such a great idea! Thanks for the inspiration. Scarlett – I think that white would work really well. 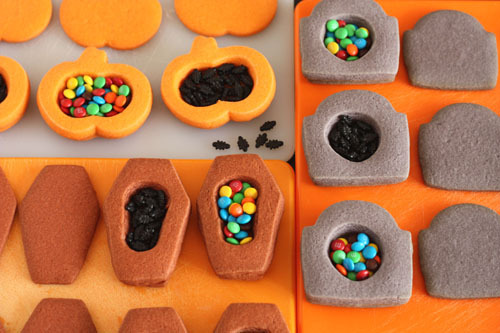 Ivan – The decorations were made using Sparkle Gel from Wilton. It comes in a tube and was easy to use but it doesn’t dry completely so even the next day it was tacky to the point that I couldn’t stack the cookies. I saw these and thought they were great! 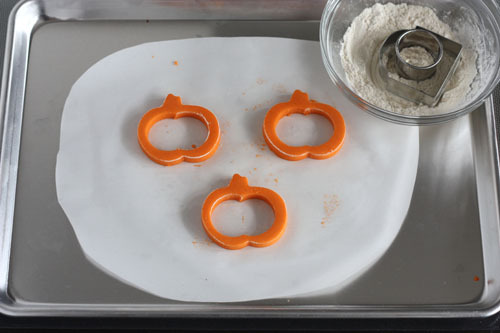 I’m going to try baby rattles for a shower I was asked to bake for … so cute! What a great idea! I have to try it! Thanks. Sheri – Ooooh, that would be perfect! Scott, my husband, and I took to shaking the cookies to see if we could predict if they held candy or ants. They make a great noise. Could you be ANY more awesome , OMG . 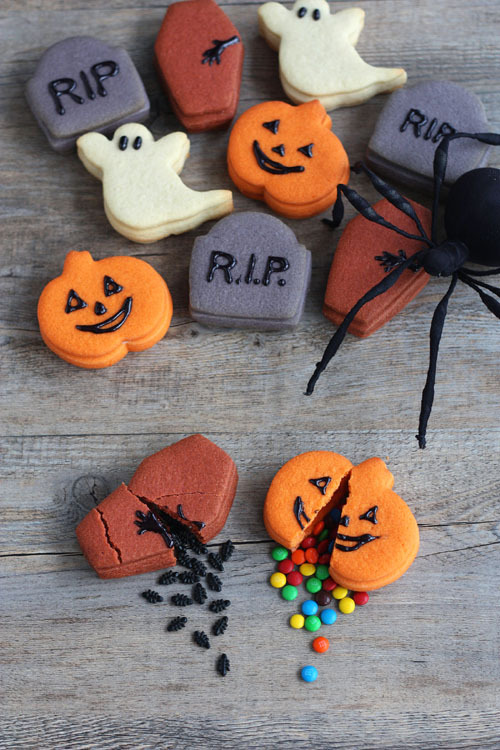 I am in love with these cookies, for sure I have to try them…. I linked to your recipe on my blog – thanks for sharing! 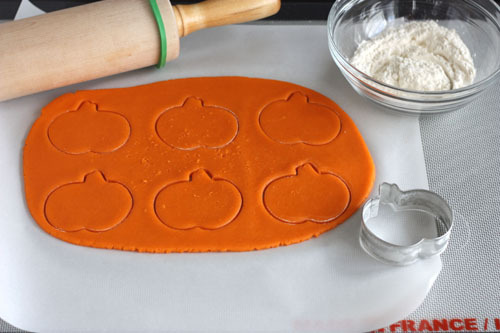 Karen – I tried about six sugar cookie recipes to find one that didn’t spread too far, and I chilled the dough really cold on the baking sheet (so the baking sheet is cold too) before putting in the oven. 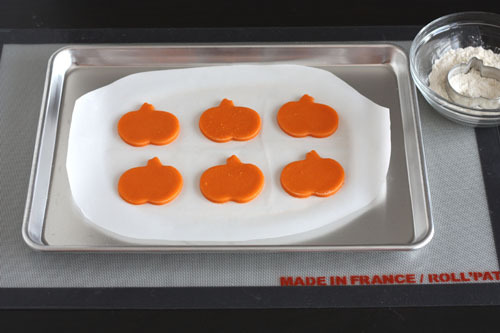 Someone on Twitter mentioned using a non-aluminum cookie sheet might also help. 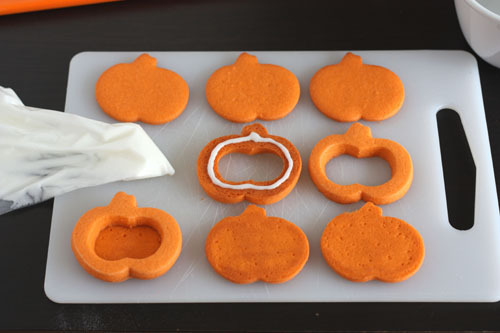 In general I found that the cookie recipes that used less butter spread less. I hope that helps! Tia – I use coloring paste, it’s really intense and doesn’t add too much water. I didn’t know about the mini reeses! I will go seek those out! Love these! There is a candy called Bonz, i think there are supposed to be dog bones but they would work in the coffin as regular bones. Lyna – They were cake decorating sprinkles produced by Wilton, I found these at Michael’s Craft store. They are most likely seasonal and not available anymore, but check on the Wilton site, maybe they have off-season things for sale. Good luck! My very favorite thing about this has to be the candy ants!! I love these… I am going to use these recipes, but I am making a lot of them. Have you ever made the dough one day and froze it, then cut them and cooked them on another day, and then put them together on another day? What would you suggest? Thanks!!! Also is there a gold gel food coloring or gold coloring paste? Where could I find that? Thanks!! Also how much thicker did you make the middle compared to the outside? Thanks. These are fantastic. I also love your other Halloween-themed ideas. I’m glad I found your blog. I love baking. Super Cute Idea for Little ones, and big ones! what size cup did you use for weighing? Brilliant idea by the way! Charlotte – I do not remember, it would have been a medium sized mixing bowl most likely. 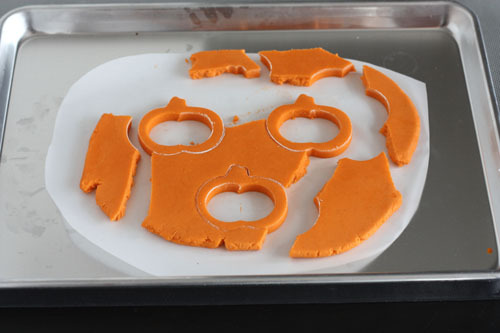 How many cookies were you able to make with the recipe you provided? 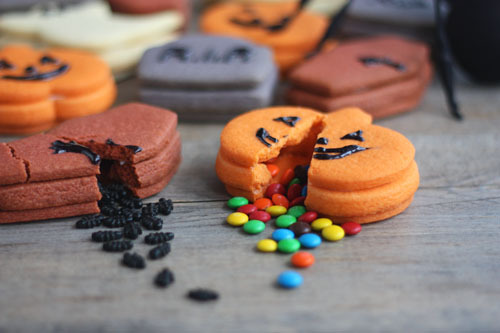 I am going to attempt to make these for a Halloween office party we are having. Thank you! Has anyone tried making and freezing these ahead of time? How did it work out?